FSMIS (June 26, 2013): What do these three young men, William Belger, Sammy Setik and RJ Rokop, (photo above) have in common? Probably a lot. For starter, they are wearing tank-tops bearing Guam on it. 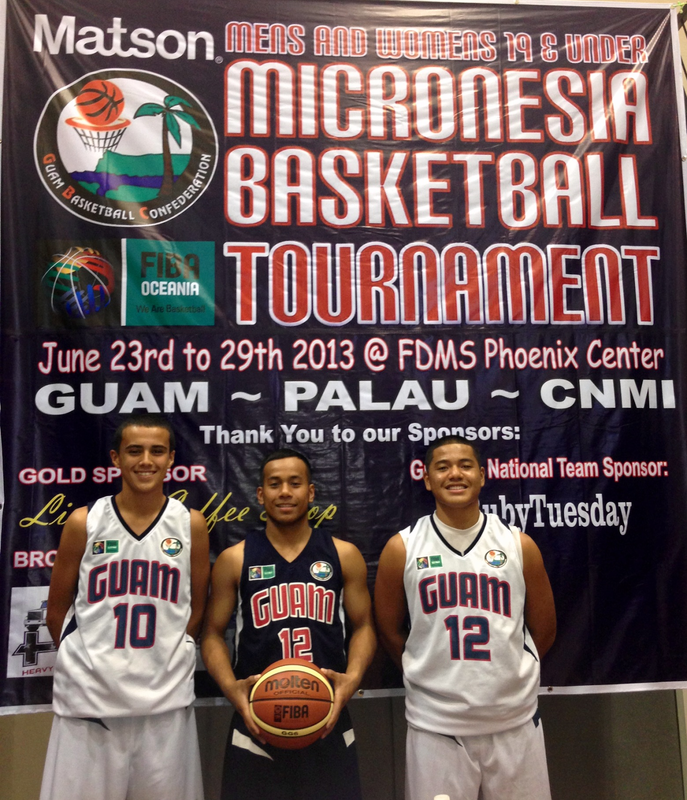 True, they played for Team Guam in the recently concluded Micronesian Basketball Tournament -- and they played WELL! These three young stars are widely covered in Guam's on-line and press news for their amazing achievements in sports. And not just one sport. They are actually seen as very multi-talented sport-wise and academically. And their "similarities" don't end there. It is not easy to pick out in the media coverages of these lads that they are linked to Micronesia -- specifically the country more known by these three letters. F- S- M.
According to Mr. Reynold Rokop (RJ Rokop's deservedly proud Dad! ), Sammy Setik, like RJ, is from Chuuk. William Belger is from Pohnpei. I do believe, however, that all three of them were born and raised on Guam. I may be dead wrong. The Guam Sports Network website indicates that Setik and Belger have siblings who have been quite remarkable in sports as well. I know that RJ has a sporty older sister plays volleyball for the Academy of our Lady of Guam. In the past few days, RJ and William played for the Guam under-16 while Sammy played for the Guam under-19 in a Matson-sponsored tournament (with other sponsors) that brought together quality teams from Palau, CNMI and Guam. And, in their opening games, these three were reported as leading scorers. If I am not mistaken, these capable hoopers have represented Guam in competitions abroad, including the Far-East, since middle school. And let us face it. Undeniably, Guam school setting (including other factors) has brought out their best talents and nurtured them to become who they are today. From all indications, they will only get better. I will let you figure out the rest. Other useful information could be found via the Guam Sports Network, much like the story in this link http://www.guamsportsnetwork.com/basketball/set-of-setiks/. Congratulations to Setik, Belger and Rokop, their parents, and those who had a part in molding them. FSMIS (June 26, 2013): On June 25, President Manny Mori received Mr. Leo B. Tudela, accompanied by the Federated States of Micronesia (FSM) Postmaster General (PMG), Mrs. Ginger Porder Mida, at the President’s Conference Room. Originally from the Commonwealth of Northern Marianas, Mr. Tudela is the Director of the United States Postal Service (USPS) Asia-Pacific Relations Unit based in the State of Hawaii. Although not his first time around, President Mori welcomed Mr. Tudela to the FSM as they exchanged greetings and harked back to shared memories. Mr. Tudela expressed gratitude for the opportunity to meet with the President. Among other observations, he commended on noticeable improvements at the FSM Postal Services (FSMPS), including the decision to change office color and build a nationally-based identity. He said he was “very impressed” at the overall up-scaling in office facility conditions and improvement in management conduct, which he attributed mostly to PMG Mida’s professional leadership. As a suggestion, Mr. Tudela encouraged steady emphasis in FSMPS’s philatelic section as a viable revenue-generating service area as already realized in other parts of Micronesia, prompting input from Mrs. Mida who confirmed her keen interest in boosting this aspect. President Mori welcomed the comments made by Mr. Tudela and said he was aware of the noted improvements, especially at certain FSM Postal Service areas where office locations and management integrity were significant issues. Mr. Leo B. Tudela is in Pohnpei to conduct a “joint postal inspector security investigation training” from June 25 to 27 at the FSM Post Office facility in Kolonia. For further information, call the FSMPS Office at 320-2614 or email fsmpio@mail.fm. FSMIS (June 25, 2013): On June 24, President Manny Mori extended an invitation to FSM Speaker Dohsis Halbert to consider joining the FSM delegation to the Micronesia Presidents’ Summit in Palau on July 11-12. The Summit is the premier Leaders’ meeting among the Federated State of Micronesia, the Republic of Palau and the Republic of the Marshall Islands whose contiguous geographical jurisdictions span an ocean area of approximately 2 million square miles – two thirds the size of the Continent of Australia and slightly twice the area combining the states of California, Nevada, Arizona, Utah, Colorado and New Mexico in the United States. A few cabinet members having direct technical input and outcome review obligations will accompany the President to the meeting. FSMIS (June 25, 2013): On this day four years ago (June 25, 2009), President Manny Mori stood at the Tallberg Forum in Tallberg, Sweden as the keynote speaker on the realities and impacts of climate change. The theme for the forum was: "How on Earth can we live together within the planetary boundaries". Here is the link to the speech: http://www.fsmpio.fm/Speeches/mori/tallberg_forum_2009.pdf. FSMIS (June 24, 2013): The Pacific News Agency Services ran a report today on an unprecedented act of parliament in the Pacific that took place on June 24 in Samoa. Forty-four parliamentarians in Samoa voted unanimously in favor of a constitutional amendment bill that reserves 10 percent of the seats in Parliament for women candidates. "It's a new dawn for women," Speaker of Parliament, La'auli Leuatea Fosi was reported to have said. The world has changed and mothers have achieved advanced expertise gifted them by God which should be used to benefit the country, Samoa Prime Minister Tuilaepa Sa’ilele Malielegaoi said regarding the unfolding situation. Comes next general election in Samoa, parliamentary configuration will usher in a new bottom-line gender distribution in the Parlimentary of Samoa, based on the new constitutional requirement passed by MP's today. Be it resolved that the FSM Constitution should be amended to create an additional At-Large seat in Congress for each of the four states, election to which shall be open to only women candidates. This proposition had met consideration of FSM Congress when introduced as Congressional Bill No. 15-169 on November 27, 2008 and revised for reconsideration on June 29, 2012 as C.B. No. 17-147. In both instances, the proposed change only "sparked discussions" among parliamentarians. It was even voted down in a "mock congress" at the FSM National Women Conference in July 2012. With repeated public scrutiny involving various sectors of the population, and given the fresh decision from Samoa's lawmakers, the topic seems to have gained added fervor in the slowly modernizing Pacifc context. The Pacific region has had been criticized for having the least direct women involvement (presence) in law making bodies in the world. This is a release recently received. Under advisement from the Office of SBOC, FSMPIO disseminates the release given its important implications to traveling FSM citizens, even if the piece itself appears long overdue. Foreign visitors arriving in the U.S. via air or sea who need to prove their legal visitor status to employers, schools, universities or government agencies will be able to access their U.S. Customs and Border Protection arrival/departure record information online when the agency starts its records automation on April 30, 2013. For more information and for answers to frequently asked questions, visit CBP’s page (CBP.gov/I94). Information provided by regional and international weather forecast models indicate that a major storm system near New Zealand is pushing heavy swell waves up towards the tropical Pacific Islands today. This could cause coastal damage in Fiji, Tonga, Cook Islands, and Niue. Significant swell waves are also expected in Samoa, American Samoa, Tokelau, Wallis and Futuna and Tuvalu. Waves of over 4 metres are possible around Fiji and Tonga. The arrival of these swells will coincide with large Spring tides and a full moon this weekend. Those who are in vulnerable areas at risk of coastal inundation during heavy swell events should contact their local meteorological service for more information. FSM Law Day debates have been a trademark of the FSM Judiciary Branch since the event was inaugurated in the early 90's. Inputs by the Executive and Legislative Branches are furnished through representatives with legal knowledge or strong educational/ professional backgrounds. FSMIS (June 21, 2013): In exactly three weeks leading up to the big event, organizers of the 2013 FSM Law Day Debate held a meeting today at the FSM Supreme Court facility in Palikir, Pohnpei. According to Mr. Belan Yoma, this meeting might be the last for the committee that has been handling all-around preparations for the July 12 premier annual nation-wide high school academic contest. However, other members expressed before close of work today that one or two more "final meetings" might still be in order. The topic for this year's debate contest is: Be it resolved that the FSM Constitution should be amended to create and additional At-Large seat in Congress for each of the four states, election to which shall be open only to women candidates. Earlier this year, high schools within each state held their rounds of debate with the same proposition to determine the their respective state teams to the National face-off in the summer. This year's final four show-down will take place in the State of Chuuk, home of last year's champion debaters from Chuuk High School. FSMIS (June 21, 2013): The FSM Office of the President has confirmed to the Diocese of the Caroline Island's office in Chuuk that President Manny Mori will attend the opening day of the week long meeting of the Episcopal Conference of the Pacific (CEPAC) -- a group of bishops and prelates of the Catholic Church in some islands of the Pacific. The meeting will begin on July 8 in Chuuk, with most participants arriving on the 7th. Bishop Amando Samo of the Diocese of the Caroline Islands, which includes the Catholic Churches in the FSM and Palau, extended an invitation to the President on June 7 when the two had a meeting opportunity in Chuuk, asking for the President's presence at the "welcoming" of the prelates during the opening of their conference. The President's priority agenda for the earlier part of July is to attend the Micronesian Presidents' Summit in Palau on July 10th to 12th. However, he has decided to make room for the invitation, requiring adjustments to previously set time frames. According to staff members of the Chuuk-based Diocese of the Caroline Islands Chancery, over ten (10) bishops and prelates have confirmed attendance of the meeting. The Archdiocese of Agana (Guam), the Diocese of Chalan Kanoa (Mariana Islands) and the Prefecture of the Marshall Islands are also CEPAC entities. The eighteen memberships in the conference include the Papal Nuncio (Diplomatic Representative of the Holy See) to Oceania whose office is based in New Zealand. FSMIS (June 20, 2013): June 23rd and June 24th are Constitution Day and Cultural Day for Nukuoro Municipal Government according to Mr. Senard Leopard, Nukuoro Mayor Representative. President Manny Mori has granted administrative leave for legal Nukuoro residents at the national government. "Pursuant to the FSM Public Service System Regulations, Part 10.3(g), I, President of the Federated States of Micronesia, declare that it is in the best interest of all National Government employees who are legal Nukuoro residents working in the National Government be granted administrative leave to observe these holiday." An official notice and request from the Nukuoro Municipal Government was received at the Office the the President on June 18, making administrative leave request on behalf of its residents. FSMIS (June 20, 2013): At its first regular session that ended on May 30th, the 18th Congress of the Federated States of Micronesia adopted the following resolutions. C.R.No. 18-01: Inviting the President of the FSM to deliver the State of the Nation Message. C.R.No. 18-02: Designating and appointing Mr. Lam Dang as Legislative Counsel of the 18th FSM Congress. C.R.No. 18-03: Expressing the sincere gratitude and appreciation of the FSM Congress to Sister Maria Perez Cabellero for her lifetime of dedication to improving the quality of education in the FSM. C.R.No. 18-04: Approving and accepting a grant in the amount of $949,600 from the UNFPA, for funding implementation of UNFPA annual work plans relating to the 2013 to 2017 multi-country program for Pacific Island countries and territories. C.R.No. 18-09: Approving and accepting grant assistance in the amount of $128,410 for the U.S. Department of Health and Human Services Administration to fund the Maternal and Child Health Services in the FSM. C.R.No 18-11: Approving and accepting a grant of $76,849 from the U.S. Department of Health and Human Resources Centers for Disease Control and Prevention to fund FSM HIV Programs for communicable disease prevention and control project. C.R.No 18-17: Approving and accepting a grant in the amount of $209,129 from the U.S. National Park Services and Historic Preservation Fund to fund Pohnpei Historic Preservation Office. C.R.No. 18-20: Approving and accepting a grant from the Secretariat of the Pacific Community in the amount of $63,093 to fund the implementation of the Pacific Regional Strategic Implementation Plan II. C.R.No. 18-22: Expressing sincere gratitude and appreciation for Mr. Jonathan Pinkney Baird for his service as a staff attorney for the FSM Congress. C.R.No. 18-25: Designating and appointing Mrs. Liwiana Ramon Ioanis as Chief Clerk to the Eighteenth FSM Congress. C.R.No. 18-26: Setting the ceiling of the total funds estimated to be available for appropriation from the General Fund of the FSM for fiscal year ending September 30, 2013. C.R.No 18-27: Expressing sincere gratitude and appreciation of the FSM Congress to Father Francis X. Hezel, S.J. for the spiritual guidance, intellectual challenges and knowledge he has shared with others in the FSM over the past 50 years. C.R.No. 18-29: Authorizing the President to submit recommended National Government Compact Budget request, as revised pursuant to Congress recommendations, to U.S. under Article V of the Fiscal Procedure Agreement. Contact the FSM Congress PIO at fsmcongresspio@mail.fm for details. FSMIS (June 20, 2013): On June 18, President Manny Mori signed into law Congressional Act No. 18-02 to become Public Law 18-03. The new public law is the sixth revision to the original appropriation law numbered 17-68 that became law on December 3, 2012 for “public projects and social programs”. This appropriation was for a total of $5,697,383 million, which included some amounts owed to FEMA by the State Governments. The amendment was made to accommodate changes to the use and allottee of funds in the States of Yap, Kosrae and Chuuk, “and for other purposes”. “I acknowledge that a committee report mentions some of the changes for Yap’s portion of public projects. However, the fact that there is no explanation of the amendments for Kosrae and Chuuk projects contradicts a transparent process”, President Manny Mori indicated in his signing message to Congress. President Mori reiterated his concern that several public project appropriations lacked careful and transparent planning and appeared to have been decided in haste. He stressed his observation that many of the “so-called public projects and social programs” bore “little linkage to the Strategic Development Plan (of the FSM)”. The new public law can be viewed through the link below from the FSM Congress website. On another measure, President Mori “reluctantly signed” into law Congressional Act No. 18-04, which has become Public Law No. 18-04. This legislation is for a supplemental funding of $80,000 from the general fund of the FSM to make available $70,000 to Congress Office and $10,000 to the President’s Office for the remaining three months of this FY 2013. For specific information, contact the Public Information Office at 320-2548 or email fsmpio@mail.fm.